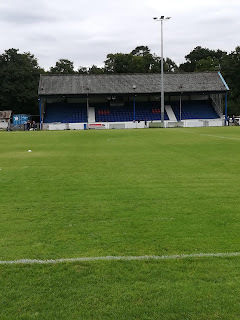 Things only improve as I reach the ground and upon enquiring where I should park am told you pay your entrance fee (£8 for adults) there and then park pitch-side. Literally pitch-side. The welcoming is friendly and I get a further bonus when I am told that there will be no charge for my two young children. This also happened at Saltdean in midweek, and it’s great to see these clubs doing all they can to encourage more youngsters to attend their matches. Seriously, if you love football, have young kids, and are on a tight budget, then get yourself down to your local club. It’s well worth it. 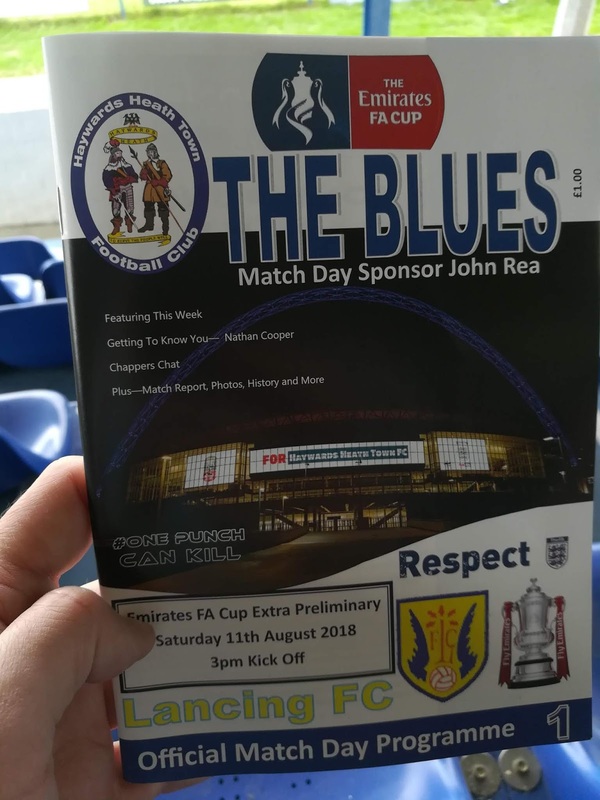 The match-day program (£1) was also extremely well produced, and packed full of information about the home-team, with a couple of pages set aside for the visitors, Lancing FC, as well. Taking a seat in the main stand, it has to be said that the tannoy system was quite loud. Not that I’m complaining. The music I heard was good (Foo Fighters) and the sound at least went someway towards drowning out the incessant questions from my two young companions. One of the first things my eldest pointed out to me as we waited for the match to begin, was that the Haywards Heath number 9 looked quite big. He was talking about a player named Melford Simpson. Anyone who has seen Melford play before will realise that my son’s observation was something of an understatement. It’s akin to say that Neymar occasionally might spend more time rolling around on the floor than strictly necessary. He’s huge. I instantly find myself wondering how the Lancing defence will cope with the aerial threat that he must clearly possess. Having witnessed a seven-goal thriller a week ago, and a 3-2 comeback from 2-0 down on Tuesday night, I’m hoping for more goals galore today. Mu hopes are raised just over a minute in, when SCFL-Premier side Lancing are awarded a penalty which is duly dispatched by Charlie Pitcher (see video). A goal already and less than two-minutes played. The signs are good. Unfortunately, the signs lied. The rest of the half is fairly scrappy. Heath look a little off the pace (this is their first competitive game of the season, and Lancing’s third) and despite getting in down the sides on a couple of occasions, the final ball is often poor and there is nothing for their big striker to feed on. Lancing are happy to play on the counter, and their number 7 (Jack Langford) is a constant source of problems. Unfortunately, he looks like he might have played a bit too much foot golf over the summer and still be a little confused by the target he’s aiming for. One skewed shot smashes into the corner flag and stays in play, while another ends up not too far away. Aside from a couple of penalty shouts for Heath (which could have been given) and another for Lancing (which also looked touch-and-go) not much else happens in the opening 45 minutes. It’s the same in the second-half, too. Heath certainly have more of the ball, and look to go more direct, trying to exploit Simpson’s flick-ons, but they still struggle to create clear cut opportunities. They have one, possibly two, that they really should convert, but the Lancer’s remain largely untroubled and still look dangerous on the break. And so to injury time, when the game is finally put to bed. The super-speedy Langford is set free, holds off two challenges, and this time makes no mistake with his finish, to send the lower league side through to the next round. And this season, FA Cup progression really means a lot to non-league teams. As noted in the program, the winners in this round receive £2,250 from the FA (the losers get £750). This is far more than in previous seasons, and the amount is only increased the further in the competition they get. A massive amount of money for teams at this level, and something that will ensure team’s give their all to progress as far as they can. The magic of the FA Cup is alive and well and I, for one, am looking forward to the next round of action in a few weeks’ time.